There is 60 shades of brown, so if you are not sure if you have medium or dark brown hair ask a few friends or family members. Harvest Moon brown blends with all browns. If you have dark brown hair and you want a lighter color, this color is not for you! If your hair is dark brown from henna hair dye, then you will need to lighten it first before using brown. Please see our lighten your hair in 48 hours naturally page. It is very easy to remove henna this way, however not chemical hair dye. If you have medium brown hair you are looking at the correct color. Our brown does not have to match your exact color, it will in fact cover white and gray hair and blend naturally. If you only have white root growth, then just focus on the roots and “feather” the dye in. If you have strands of gray or white, you can do your entire head and it will blend right in. If you are all white the color “might” come out lighter. This is not the case for everyone, more so for people who have bleached the hair white or blond. If this is the case then you might want to go with a darker brown the first time. The great news is Harvest Moon is 100% chemical free and you can use it as often as you like. 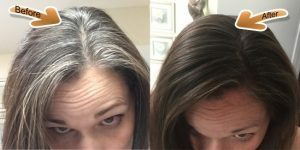 If you have white hair and it has been 24 hours after you rinse the dye out of your hair and you do not feel it is dark enough, then you can simple do it again. The reason we say wait 24 hours is because Harvest Moon will darken over 24 hours. so be patient. Once you have established your color, simply do root touch up as needed. The more you use it the easier it will be. If you have used chemicals you need not worry. You can literally chemical hair dye and then immediately use Harvest Moon over the chemicals. Your hair will be instantly soft after your first shampoo. 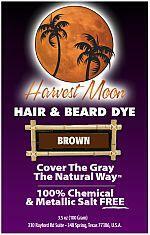 Harvest Moon has natural conditioners that condition your hair while it is adding color. Please remember colors might come out lighter on chemically dyed blond hair. We always recommend a strand test to see what color to expect. Your curls are safe and you will notice your hair will start to grow faster. This is perfectly normal and a healthy sign your hair is doing better. Harvest Moon will also protect your hair from the sun’s harmful UV rays. One package contains 100 grams or about 4 ounces of powder. This is enough to do shoulder blade length hair. If your hair is thick, you might need 1 pack and 1/4th pack mixed. Powder mixed thicker is always better than runny. So make sure you get enough to get the best results. Whatever you do not use, store in a dry cool place out of light and it will stay fresh up to one year. Unopened it is good for 4-5 years.